The Garaventa Evacu-Trac is designed with the operator and passenger in mind. As the only evacuation chair on the market with a speed governor and brake, you can be assured of the simplest and safest evacuations. Our non powered unit for standard evacuation down to grade level and our powered unit designed for evacuating up to grade. The Garaventa Power Evacu-Trac is the only powered evacuation chair on the market. 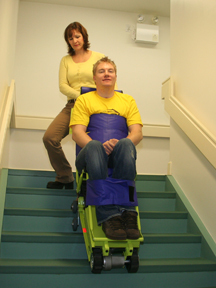 This unique chair is able to transport people with disabilities or injuries up or down a stairway quickly and safely. 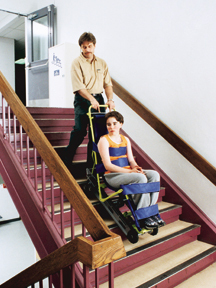 All evacuation chairs can help transport people downstairs, but the Power Evacu-Trac can easily help to evacuate a large passenger up a stairway from a lower floor and out of the building to safety.